Reiki is an energy healing system founded by Mikao Usui in Japan in the early 1920’s. It is a gentle yet powerful practice that facilitates a connection between you and the universal life force energy of which we are all a part of to facilitate healing. It promotes well-being to the many levels we have as humans – physical, emotional, mental and spiritual. Reiki can be safely used in conjunction with all other conventional health practices. Reiki does not interfere with medical treatment, it enhances positive benefits of medication and helps in removing negative side effects. 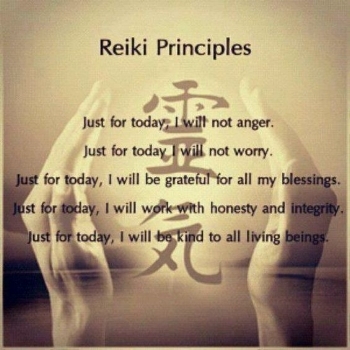 · The manifesting facets of Reiki help to bring intentions and goals to fruition. During a Reiki session you are lying down, fully clothed. Hands are laid gently on the body, held in each spot for anywhere from 1 – 5 minutes. It does not require any special breathing or focus. Visualize an hour long savasana……. Simply lie there and let the Reiki do the work.